Here is how you can cover a cake with Fondant. Covering a cake with fondant instantly transforms it into an elegant and eye catching cake. Fondant & sugar paste give a velvety finish to the cake, making the overall appearance look clean, tidy and appealing. A covered cake no longer looks rustic (unless, a rustic look is part of your design), it looks elegant and ready for your artistic vision. Once covered with fondant, it is ready for all sorts of other decorations you wish to incorporate in order to carry out create different themes. It is even a medium on which you can paint and showcase the true artist in you. With that said you do not have to be Picasso to decorate cakes!! Everyone has an artistic side, and art as it is, a very personal and individual thing. 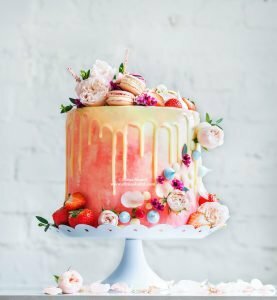 Whatever type your art is, there is always buyers, which is why these days there are more cake designers and decorators than there is flour, and they are all in business! So don’t worry and go express your unique style and with a bit of practice and brushing, in no time, you will be having lists of regular clients for whom you are making amazing cakes! Remember, a cake is still an edible medium. As such flavour is of the essence. So keep in mind that fondant, sugar paste, Icing, frostings…etc. are all made out of sugar and are eventually layers of that sugar on your cake. You want to take that into account as you decorate, you do want to make sure people come to you for decorating their cakes. Decorated cakes are not a healthy option whatsoever, and should be kept for very special occasions. Make sure to allow kids to have these cakes, only occasionally as they are heavy on the sugar and most often all things else! I have posted earlier, How to make Fondant & Sugar Paste at home (check out the links at the end of this post), if you live in area where you cannot purchase ready-made fondant, or if you like to make it yourself, then you are covered. This post is to show you how to use this fondant or sugarpaste to cover a cake. Essentially you will need to have a cake to cover. The best cakes to cover with fondant are sponges. The cake has to be dense and able to carry the weight of decoration. The decoration includes: the fondant cover, the added elements and other tiers if going for tiered cakes then also any added sculpted designs or toppers. Therefore, a cake mix won’t cut it! Should you go for a soft cake, rest assured it will collapse, that is why you need to start off with a good and dense cake. (there are many cake recipes on this website that work for cake decorations. Try the caramel mud cake, the chocolate mud cake, the chocolate fudge cake, the vanilla sponge, the pistachio cake… among others. The cakes must be completely cooled after baking and before you can attempt crumb coating them, covering and decorating them. 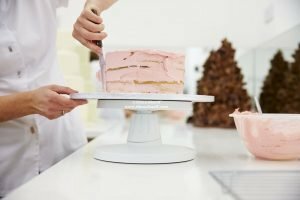 Each tier of a decorated cake usually consists of at least 2 layers, with a filling in between (could be more for tall caked). The filling can be different kinds of cream, jelly, fresh or candied fruits, chocolate shavings, rice crisps….etc or a combination of them. So you would place the first layer over a cake board that’s been spread with a little buttercream to hold the cake in place, then top with your desired filling, then another layer of cake. Ideally you should add enough filling to make for 1/4 a layer, as you would want to see the filling layer when the cake is cut. Then you will crumb coat the cake, which is covering the whole cake (2 layers) with a thin layer of buttercream, frosting of your choice or as in the old school decoration method: a layer of boiled apricot Jam. This crumb coat is mainly to hold all the crumbs of the cake in place in order not to mess up the decorations as you work. Also in order for the cake to hold together and not break as you place the other layer of cream and fondant on top. Once crumb coated you will refrigerate to firm up. Once firm, you will cover the cake with the full layer of buttercream/frosting/ganache…. and will smooth all the edges. (see the video above). Once done, refrigerate the cake again to firm up. Don’t cover the cake with fondant while the cream is fresh and soft as it will start collapsing/making bubbles everywhere. This step is crucial as it helps hold the cake together and in place, ready for covering. You can make your fondant, following the recipe on this link for plain fondant, or the method in the video above for marshmallow fondant. You can use the fondant white or you can tint it to any shade you like. The white fondant can be selectively tinted once applied on the cake, using an airbrush, or by brushing with powdered colours creating drawn designs…etc. If you decide to tint your fondant, then make sure to tint a bigger quantity than you think you would need. This is because it is very difficult to get the same shade of the colour, should you run short for any reason. Use the gel-based food colours for best results. Powder colours also work, but will take quite a bit to get the right shade (check out the link for how to make your own vegan and preservative/chemical free food colours in the links at the end). Liquid colours are not a good option here as they affect the consistency of the fondant making it too wet and therefore sticky and spoilt. Remember: go for a small amount of colour at a time, then work your way through to the right shade. Colours like reds, black, royal blue…etc are harder to achieve and take a lot of colour to get to the right shade. Don’t forget you are starting with a white base, there are all shades of pink to go through before white turns into Red!! So to tint, add a few drops of colour to the white fondant as in picture above, spread the colour by pulling and kneading, until uniformly coloured and no streaking is visible. The video below shows you how to make black marshmallow fondant, check it out. Fondant is made out of sugar and sugar starts melting when heated. In the same effect, too much handling of sugarpaste and fondant, transfers the heat of your hands to the paste, making it sticky and hard to handle. Therefore, you want to minimise handling. The paste can get sticky when rolled straight onto a work surface. You need to sprinkle the work surface with icing sugar. Then roll the fondant out into the size you need (a little bigger than the cake. Don’t forget that you have the top and the sides of the cake to cover. If you roll out the fondant too thin, it will be hard to handle, and will also be easier to tear. Ideally you want the fondant to be 1/8 of an inch thick. If you get air bubbles, use a very thin pin to prick them, and then smooth out with the palm of your hand. Now that you are an expert on all things fondant, I will leave you with a video of a super cool cake to start with. The Ombre Frilled effect. Not only will this help you create a beautiful cake, but you will practice frilling and tinting fondant. Best of all, until you perfect covering the cake with fondant, the frills will hide any mishaps or imperfections. If a cake doesn’t taste really good, we can decorate it all we want, the base will remain rubbish! So while everyone will love the look no one will attempt to eat. The best cake is the most irresistible cake that is eaten and not thrown. So if you are serious about this, learn baking first then go for decoration! you make it sound so easy!!! To me decorating cakes is the toughest thing! Dima, I attempted to decorate my cupcakes for halloween themed video I made….I have to tell you I am absolutely horrible at cake decoration. Inshalla, the next set of cake decorating classes that you have I want to particpate. Your cakes look fantaboulous!!!! super super post!!! It sounds so easy when u say it… I struggle at every step.. hope to get better with every cake!Cedric's cake is to DIE FOR!!! Thanks for the tutorial. I find that it's easier to cover a round cake than a square one. ohh looking forward to attending your cake decorating class. Thanks for the detailed instruction Dima!!! Thinking of making fondant covered cake for son's birthday next month… will pester you with my doubts :)Love the details in your cake !!! Really cool- i am scared of doing fondant icing and much as i plan the most elaborate cakes in my head, i always end up doing good old buttercream…so thanks a lot for this! I've never worked with fondant before, I've always assumed that it was complicated. Thanks for the tutorial. What would be a good sponge recipe for a two tier cake to be covered with fondant? Love your butter cream recipe. Thanks for share your experience!! Happy to hear that! Let me hear from you again. I am certain you ѡill be famous very quickly, ⅾue tо your quality contents. 🙂 TY, glad you are enjoying! glad I found your website and this post. Thanks a lot and i’m looking forward for more. I really appreciate your way of writing and blogging. I saved this website as a favorite and will be checking back soon. Happy to hear that 🙂 Do let me hear from you again soon! Love this post and all its content. This is really nice work thank you and looking for more.